This is a tale that begins when the protagonist died in his previous life. He was sent by a girl, who proclaimed herself to be God, to lead a second life in a different world. Chapter 5: ??? (TL: ???) ??? But you forgot to add the link hha. Got it. Will edit when I can. I have been wondering if you can actually grasp what is going on with the story. With the souls and such. If not, i want you to skim a bit, and help me find a better way to explain things. You can edit all three chapter if possible. Cool. I'll get to it. 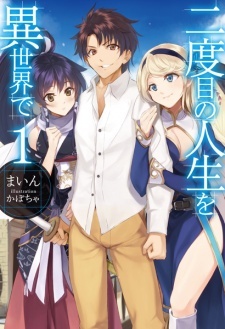 i have one question: there is some sort of harem in this novel? I assume so. I've only read what's been released, but from the cover, that seems to be suggested. thanks for the hard work~! The links are not working for me.... am I the only one having this problem? Hi, just wish to know if you'll keep tl nidoume while Elysion on hiatus or just stop this one till he's coming back? Sorry but I've got my hands full with other commitments. As such, I probably won't be working on this project until I've freed up some of my time. Not sure. The god of the world is a chibi if that gives you any indication? Well it's better then noting...but, uhm, well, i will w8 for xcrossj when he finishes with the RL troubles and gets time to translate. I like his translation more...(what the hell does this mean? "A challenging expert barehanded solider thinking this Renya was amazed"). So yeah, xcrossj, when u have time to do this. Thanks and thanks for the hard work u done till now (knw as well). Good luck with u'r RL, that comes first. it seems interesting but theres only 6 chapters (part 1 of chap 6) atm, so ill wait for it to have more chapters before reading. My Wordpress has chapter 5 edited (original by yotsubsilver.wordpress.com), and I'm working on interlude II. Oooh, I'm glad this was picked up. It's the only reason I had ever read Elysion Trans. I do hope some of the translators will split their time on this title as I dearly wish for more releases, even if they don't until Word Master has caught up with the Japanese releases. The Tales of Wickedly Vicious Underground Empire would be an interesting series for anyone that is interested towards the dark side. Very interesting, sadly I couldn't find any websites currently translating the series.